I finished knitting a new sweater the Sunday before last. This wool is from my neighbor down the street, that I told you about a few months back. This sweater was a long time in the making as I had to knit it twice. Yes, twice. The pattern is written so that you knit the front, then the back, then each sleeve. And if you’ve been knitting for a while too, you would probably have been just as disappointed that you had to knit four separate pieces. There are so many knitting patterns now where you knit the front and back as one continuous piece and combine it all with the sleeves so that it’s basically knit as one big piece. So believing that I really knew what I was doing in the knitting world, I decided to knit it from the bottom up, front and back together and add in the sleeves and work my way combining them right on through to the shoulders. Then I tried it on. As it turns out, I don’t know as much about rewriting knitting patterns as I had thought. The sweater fit horribly. Sometimes it’s very good to be humbled. My mom taught me to sew as a child and when I’d sew a seam that was slightly askew, or a dart that didn’t taper just perfectly, she’d head straight for the seam ripper and rip it out and have me do it again until I’d gotten it right. She wasn’t mean about it in anyway, it was more of just a calm insistence that every seam must be correct or you are going to end up sewing something that doesn’t fit well at all. And isn’t that a big point of making your own clothes? So they fit you much better than anything you can buy? So with that in mind, I ripped the whole darn thing out and started over. This time following the pattern writers exact directions. I sized down a needle size and a pattern size to get a better fit. And I knit all four separate pieces. Now it fits almost great…except my mom’s voice keeps calling me from the back of my head saying, ‘you’d better redo the top part of those sleeves again’. They just aren’t fitting into the arm holes correctly. That can be fixed pretty easily. Now while it was my mom who taught me about sewing and the correct fit of a garment, it was my grandma who taught me how to knit. Growing up she would have me down to her and my grandpa’s house one weekend a month. And each month she’d have a new project for me to work on. We made all sorts of different things together, from Christmas ornaments, to mushroom prints, to needlepoint, to rug hooking, and of course knitting. It was in her green floral print chairs that I first held those straight metal knitting needles so incredibly awkwardly. She was a big believer in the idea of keeping your hands busy. She too sat night after night in front of the tv with some sort of hand craft project to do, usually hand quilting. She believed in the social aspect of craft, meeting monthly with both her Quilt Guild and her Lady Fingers group (love that name for a craft group!). Had this been her day and age, she would have been so excited by all the quilting and knitting and general crafting being shared online! She was a patience and sweet teacher to me. To everyone. Aside from my parents she was my greatest influence in life. She taught us to keep my fingers busy, to keep learning, to travel and explore, to enjoy live theater, to eat your leafy greens, to appease your sweet tooth, but mostly she taught us by example to be kind and generous to everyone you meet. 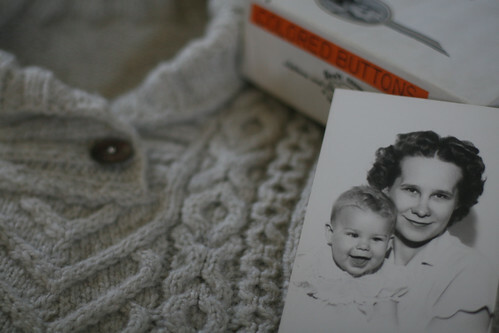 She passed away peacefully, with my mom at her side, the same day as I finished this sweater. I love this sweater. I love that the wool comes from a short walk away, from a very nice family (well from that families sheep! ), I love the cable pattern on the front. I love that it completely softened up after blocking. And I love that it will always remind me of what my grandma and my mom have taught me. People don’t last forever, but what they can teach you can be passed down from generation to generation and in that way their spirit will always be alive and with you. This sweater is gorgeous! I am very impressed because it looks like a complex pattern, but also because you’ve had the courage to knit it twice. I used to have a sweater with this kind of “neckline” (not sure it is the right word), and it makes me want to knit one too, because I loved it so much. It was comfortable and protective, in a way. I also love the fact that your wool comes from your neighborhood… do you know about the Fibershed.com project initiated in California, and now spreading through the US? I think it first was only an experiment. Rebecca Burgess wanted to only wear locally made clothes for a whole year (local wool, hemp, natural dyes…) and then the project evolved in some kind of structure, where people are still working together and promoting local creativity and resources, and clothing… You really should go and have a look. The project really is interesting! This made me cry. Its taken me 10 minutes to contain myself to write this. I’ve always felt like such an inadequet mother but this post reminds me that I wasn’t a total disaster. There is so much more I could say about the words you wrote, but I just keep crying and reaching for the kleenex. Just know that my heart is filled with love and hope right now. Kendra, that sweater is beautiful. What a touching post. You are so blessed to have such loving teachers in your life. Sorry for your loss. That is an absolutely beautiful sweater! What a gift you have. The sweater is gorgeous. Hope it feels like a warm embrace from your grandmother every time you wear it. 1. Do you happen to know where I could take a lovely quilt (Queen) to put on display, for sale? In Alaska, it was appraised at $700. The quilt is presently at the house in Sonoma. 2. We have a lot of almond trees, at the orchard in Sonoma. Is there anyone who would be interested in helping to pick them? I will Forward to you some Alaska scenery. Beautifully written and heartfelt post. And a beautiful sweater, too! I, like your mom, am still crying … thinking of all that my mom (and her mom) have left in me. That is a beautiful sweater and an even more beautiful story. I am so sorry for your loss. 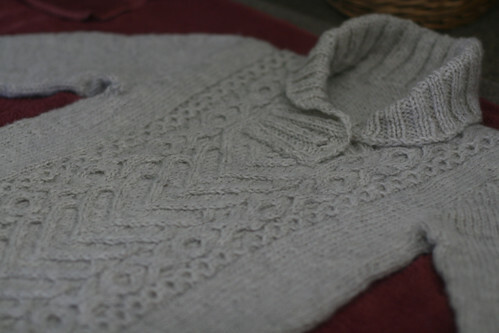 The sweater is just gorgeous, and the history behind it is beautiful as well. Family and passed-on skills are such a treasure, it’s wonderful that you keep them alive -and share with us, too! Beautiful story is as the sweater. It’s nice to know there are still people out there who love their mothers and grandmothers. Your post left a tear in my eye and reminded me of my mom and grandmas. So sorry for your loss. Your sweater is gorgeous and your story is beautiful.. My condolences on the passing of your beloved grandmother.. I know how you feel. Blessings. I am so sorry for your loss. The sweater is beautiful (as usual-you are very talented), and the story very nice. It’s cool that your mom had the opportunity to read it and know how important she is to you. Tomorrow isn’t promised, so we shouldn’t wait until Mother’s Day to let our beloved mothers know how much they mean to us and how much we’ve learned from them. What a lovely way to remember your grandma.